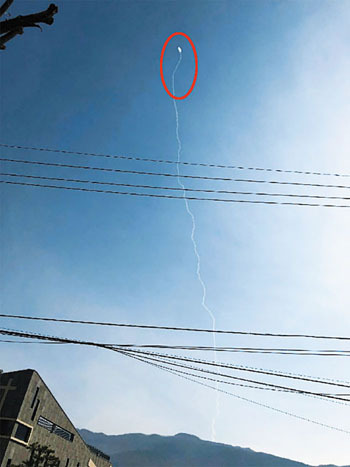 A new homegrown medium-range surface-to-air missile took off by accident during maintenance at an Air Force unit in Chuncheon, Gangwon Province on Monday and blew up in midair. The Cheongung was developed at a cost of W800 billion to replace the old Hawk missile and has been deployed warfare-ready since 2015 (US$1=W1,133). An Air Force spokesman said the missile was fired "abnormally" and self-destroyed in midair over a nearby area at around 10:30 Monday morning. Luckily the missile is designed to self-destroy if anything out of the ordinary happens during the launch in order to avoid a "Dr. Strangelove" scenario. Still, each missile costs W1.5 billion. "We understand that the missile was fired even though the button was not pushed," the spokesman added. No damage to people or property was reported. The Air Force has launched an investigation to find out what caused the accident. Amateur footage of the accident shows a zig-zagging vapor trail before the missile exploded, like a fireworks howler taking off. A military officer said, "The zigzag trajectory suggests that it was fired without a target being set." The Cheongung is supposedly capable of hitting an incoming aircraft some 40 km away at a speed of Mach 4.5. Each launch pad consists of eight missiles, which can be fired at an interval of only a few seconds. The prototype did hit a target about 40 km away with pinpoint accuracy during the first live-fire test in November 2017. An improved version, which is capable of hitting an incoming ballistic missile at an altitude of 20 km, has also been developed and is ready for deployment.